In Fall River, Amazon staffing specialist Simran Gill talked to applicants at the check-in table. FALL RIVER, Mass. 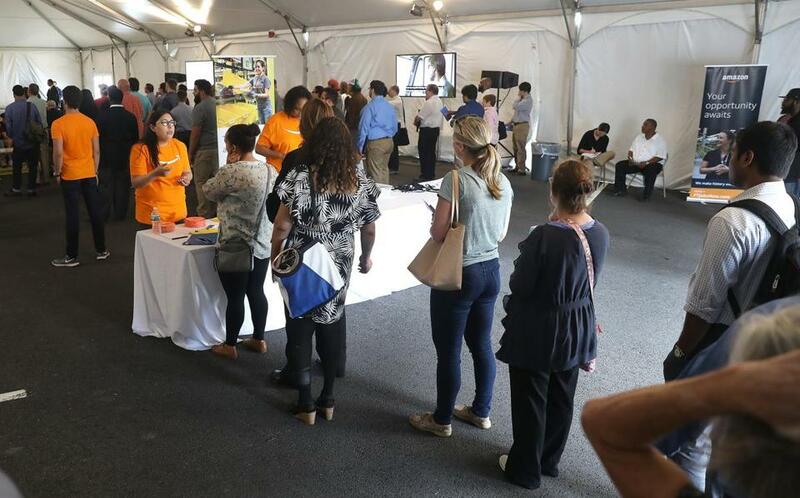 — Hundreds of people showed up Wednesday for a chance to pack and ship products to Amazon customers, as the e-commerce company held a giant job fair at nearly a dozen U.S. warehouses. 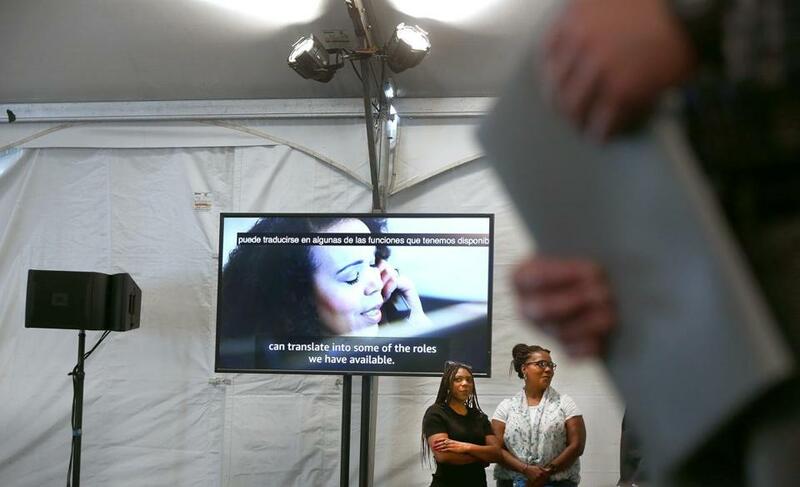 The company is advertising starting wages that range from $11.50 an hour in Chattanooga, Tennessee, to $13.75 an hour in Kent, Washington, near Amazon’s Seattle headquarters. The $11.50 rate amounts to about $23,920 a year. In Washington state, the current minimum wage is $11.50 but by 2020 this will increase to $13.50. By comparison, the warehouse store operator Costco raised its minimum wage for entry-level workers last year from $13 to $13.50 an hour. ”I’m looking to do the night shifts and then run my own company during the day,” he said. 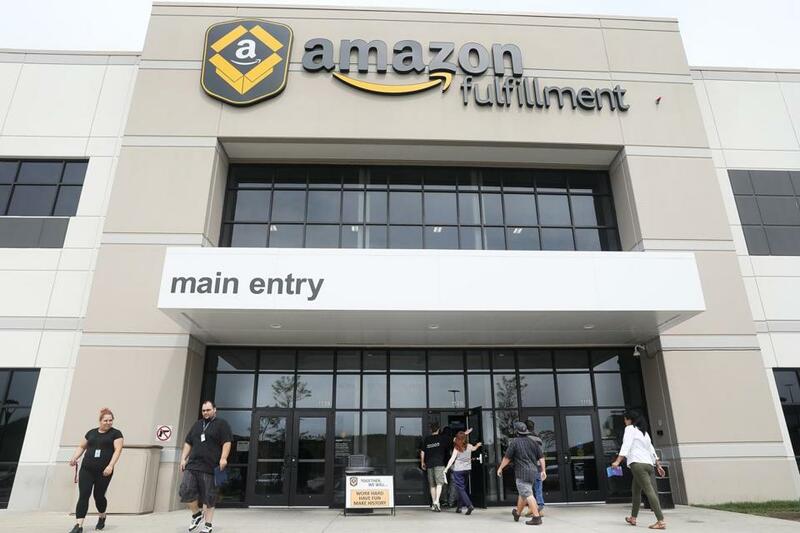 At one warehouse — Amazon calls them “fulfillment centers” — in Fall River, Massachusetts, the company hired 30 people on the spot in the first two hours. Amazon was looking to hire more than 200 people Wednesday, adding to a workforce of about 1,500. Employees there focus on sorting, labeling and shipping what the company calls “non-sortable” items — big products such as shovels, kayaks, surfboards, grills, car seats — and lots of giant diaper boxes. Other warehouses are focused on smaller products. After checking in, Zaria Bailey, left, and her mother Sonya Bailey, both of Bridgewater, waited to go on a tour. ”I like to be busy, so I know Amazon is busy and they want hard workers,” retired police officer Brian Trice said. ”It looks like they’re looking for young, healthy warehouse staff only,” said Schell, a 57-year-old searching for work that will put more money into her retirement. Amazon is also holding events at shipping sites in Ohio, Kentucky, Wisconsin, New Jersey, Illinois and Indiana. A group of job applicants, right, started a tour at Amazon fulfillment center in Fall River.